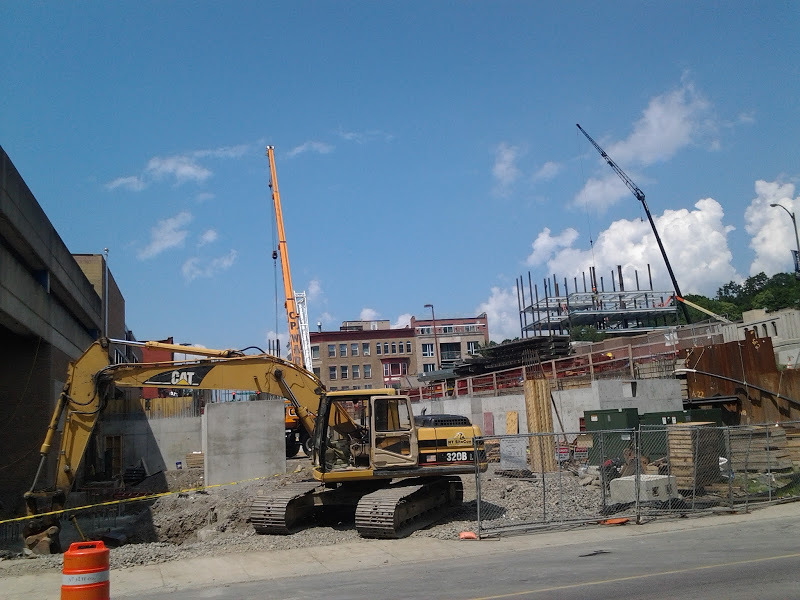 Over at the Marriott Construction site at downtown Ithaca’s 120 South Aurora Street, all of the caissons have been drilled and work is continuing on the foundation of the new 10-story hotel. 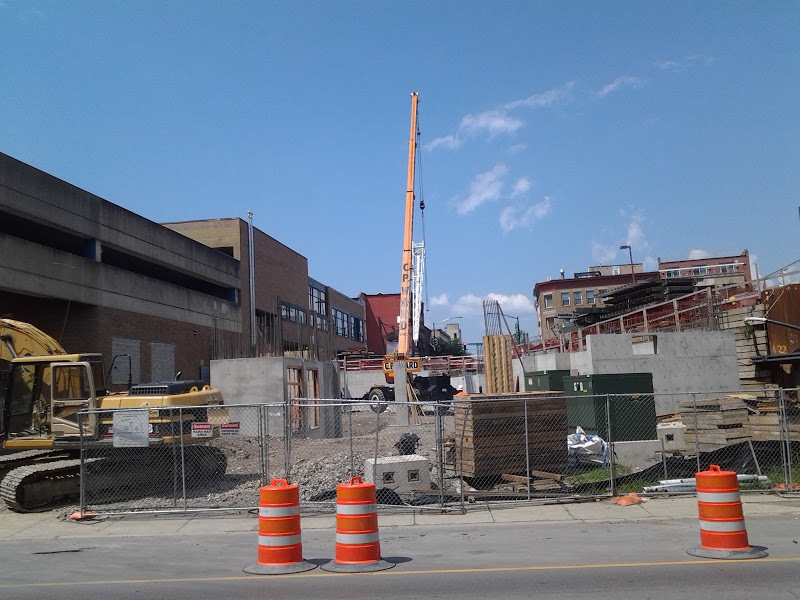 Concrete foundation footers have been have been set on top of the caisson piles, with rebar sticking out to tie-in the walls as they’re built up. The foundation walls are being poured in a range of sizes, depending on how much weight they’re going to hold. 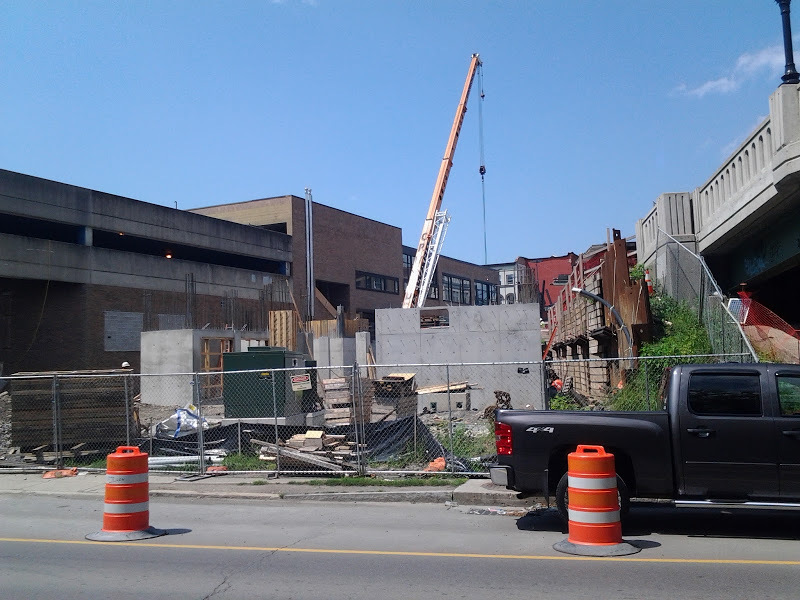 A couple footings with much taller re-bar likely indicates the location of future stairwells, elevator shafts, and utility space. 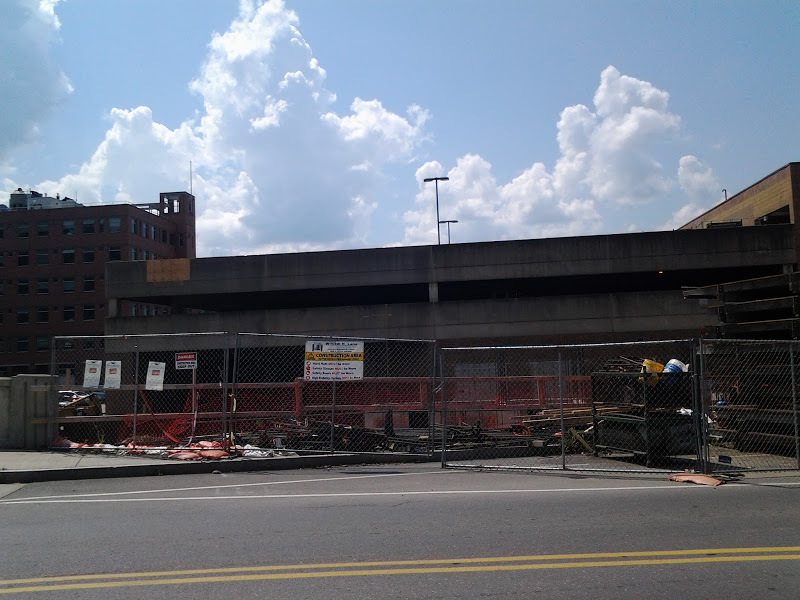 Note the plywood on the Green Street parking garage in the first photo. 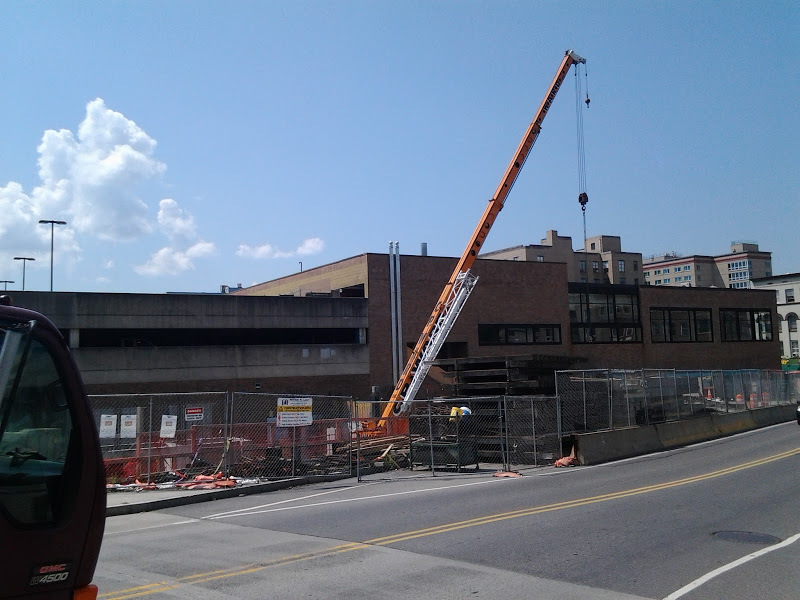 As workers were drilling the last caisson, the rig broke, tipped over and smashed into the wall of the garage. Thankfully, that section had already been closed off due to the construction, and no one was hurt. Maryland-based Urgo Hotels plans on opening the $32 million, 159-room hotel during the third quarter of 2016 (July-September time frame). The hotel will include a host of amenities, a fitness center, a restaurant with indoor and outdoor seating, and 3,000 sq ft of meeting space. Atlanta-based Cooper Carry Architecture did the design, and W.H. Lane of Binghamton is the general contractor. The project, which replaces a small parking lot. 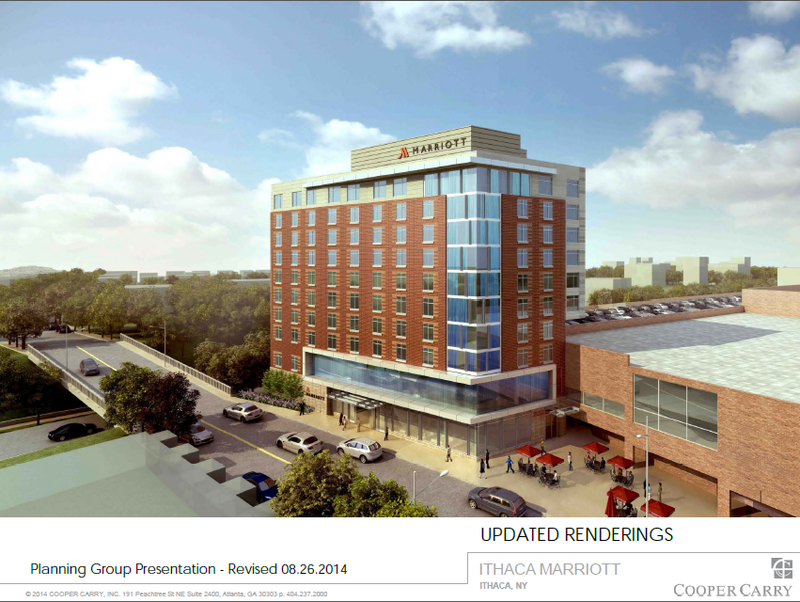 could be considered the culmination of an effort to bring a hotel to this site since 2008, when Rimland Development proposed the “Hotel Ithaca”. 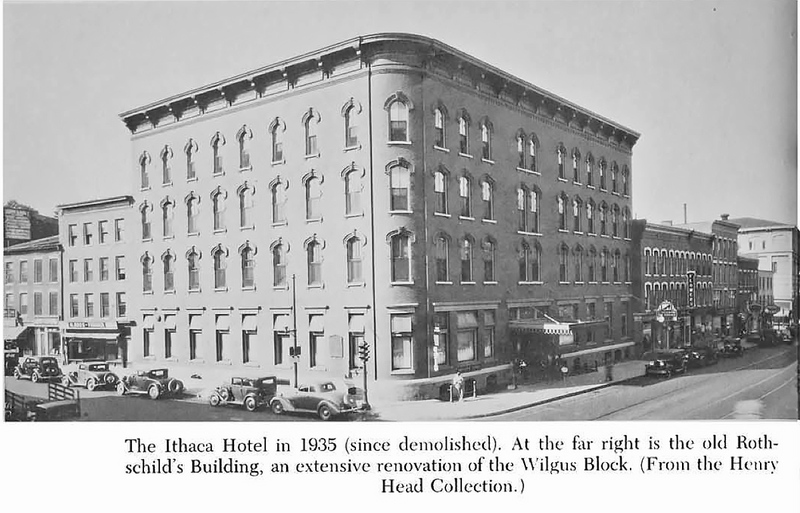 The previous Hotel Ithaca once stood on part of this site and the Rothschild’s Building, before it (and every other building in its city block) was demolished during 1960s urban renewal.